When you have a desire for specific bedding color or patterns, just design and sew your own sheets. 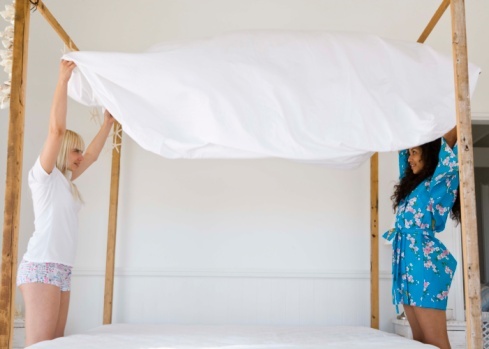 If you have basic sewing skills, you can create a one-of-a-kind set for your king size bed. Make sure you measure your mattress carefully before you begin your project; also, choose a fabric that fits your bedroom colors. The actual sewing doesn't take long at all. Create your own sheets for a king size bed -- you can make sure they will fit properly. Measure the mattress with the tape measure. Most king mattresses are 76 inches wide and 80 inches long. Measure the height of the mattress also. For example, if the depth is 10 inches, add 76 + (10 x 2) + 16 (for hemming and tuck-under) = 112 inches. Add 80 + (10 x 2) + 16 = 116 inches. Cut two pieces of fabric with the adjusted length and width dimensions or piece together more than one piece of fabric into two large fabric pieces. Set one fabric piece aside and begin working on the piece for the fitted sheet. Make a pattern for cutting out the corners of the fabric piece. Add the depth of the mattress (10 inches) and 8 inches and make a square pattern with sides this dimension. Lay out the fabric piece flat on a work surface and pin the pattern to a corner. Cut around the pattern to cut out the corner. Repeat the process at each of the four corners of the fabric. Pin the raw edges you just cut away at each corner together with right sides facing each other, and stitch along this edge using a 1/2-inch seam allowance. This will create the fitted corners of the sheet. Fold under a 1/2-inch hem around the entire perimeter of the fitted sheet and iron the fold. Turn the fabric under another 1/2 inch and iron the fold again. Pin the fold in place around the entire edge. Measure along the folded edge of the fabric 10 inches in both directions from each corner and make a mark at these points with the fabric pen. You should make eight marks around the hem of the sheet. Stitch the hem with the sewing machine. Every time you come to one of the eight marks, stop stitching and leave a 1.5-inch gap at each mark, sew around the corner, leave another gap, sew to the next corner and repeat the same process. Cut four 15-inch sections of elastic. Insert one piece of elastic into one of the gaps at a corner and thread the elastic around the corner and out the other gap. Leave about 1/2 inch sticking out of one gap, and stitch it down. Stretch the elastic so that about 1/2 inch extends out of the second gap and stitch that end down. Then stitch over the length of the stretched elastic so that it gathers neatly when released and doesn't get twisted inside the casing. Trim off the excess elastic. Repeat the process at each of the four corners to finish the fitted sheet. Fold under the outer edge of the top-sheet fabric 1/2 inch and press the fold. Fold under the fabric another 1/2 inch and press again. Stitch around the entire edge of the sheet to hem the top sheet. Lay the sheet out flat with the wrong side facing up. Fold the top edge down 5 inches and press the fold with the iron. Pin the fold to hold it in place. Stitch along the folded edge of the sheet, sewing 1/4 inch away from the top edge, the side edges and the bottom edge of the fold. This top-stitching will create a tailored top edge of the top sheet.